The kids are sure to have a hoot this year with an adorable ‘Whoo’s Thankful’ kids Thanksgiving table setting. If you’re hosting Thanksgiving why not create a kid friendly table that will keep the kiddos busy and entertained. This orange owl themed table setting is colorful, playful and easy to throw together for a special kids Thanksgiving table, they’ll love to call their own. 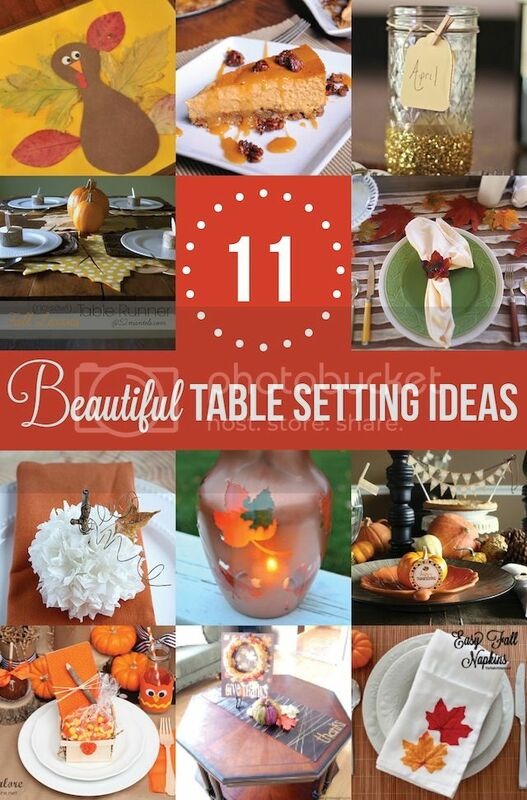 And make sure you stick around to check out eleven other creative Thanksgiving Table ideas from some of my talented friends in this month’s blog hop. Last year I hosted a Whoo’s Thankful Party and I loved the concept and especially loved watching our kids excitedly express all the things they were thankful for. So this year I decided to carry that theme over to our Thanksgiving table. I covered the table in brown craft paper for a fun surface the kids can doodle on…and it also makes clean up super easy! I used tree branches stuck in tin cans for an easy centerpiece and added mini orange pumpkins for a pop of color. Caramel apples displayed on wooden pedestals make a pretty dessert and table decoration too. I put a small wooden basket filled with candy corns and a gratitude journal at each place setting for a simple take home gift. I made felt owl drink covers for my milk bottles and added an orange striped straw for that whimsical touch every kids table should have. At each place setting I also included a “I’m Thankful For” journal that the kids could draw or write in while waiting for dinner. Kids love feeling like they are part of the festivities and creating a special kids Thanksgiving table helps keep them involved. Don’t forget to visit my friends for 11 Beautiful Table Setting Ideas to help you get ready for the big Thanksgiving feast! Seriously, can you adopt me? I absolutely love how you decorate everything! So creative. You knocked it out of the park… AGAIN! Love LOVE LOVE! Love all of these ! Pinning away! Amazing! So creative you should be crowned Super Duper Woman! Hi I’m working on a story for CafeMom on kids’ table ideas for Thanksgiving and love your adorable ideas. I’d like to request permission to use your photo. We would, of course, give credit to you and link back to your site for how-to. Hi Julie! You are welcome to use one image from the post with proper credit given to Giggles Galore and a link back to the original site. We’d love to see it when it is published so feel free to tag us or send us the link so we can share it too! I want to be a kid again and sit at this table! I love the gratitude book and the neat way you packaged the crayons! My other favorites are the cans upcycled into holders for the branches. What great ideas you have! Thanks for stopping by Zaleina, the gratitude books are on of our favorite traditions.